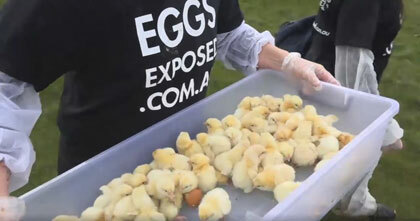 "On 19 July 2016, Animal Liberation NSW and Aussie Farms released the first-ever Australian footage of male chicks being ground-up alive as waste products of the egg industry (www.EggsExposed.com.au). Two days later in an action organised by Aussie Farms, around 100 activists converged on the facility near Bendigo, Victoria, where the industry-standard practice had been filmed, with 21 entering the property to shut down the macerator and draw attention to the inherent cruelty of the egg industry. 5 activists chained themselves to the conveyor belts and other equipment. Over 150 male chicks were rescued from certain death and will now live long, happy lives with experienced carers."